Please refer to our stock # 1747 when inquiring. 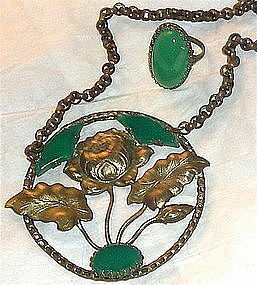 (A) Circa 1920 necklace with a 2 1/2" round medallion pendant decorated with an applied floral leaf ornament containing 3 prong set green glass stones resembling agate or chrysoprase. Neck: 26" overhead 4mm chain. Take both with your USA ck or USPS MO. $12 USPS Priority/Ins/ Track or Free with your USA Ck or USPS MO. Please examine each image and the info below it.